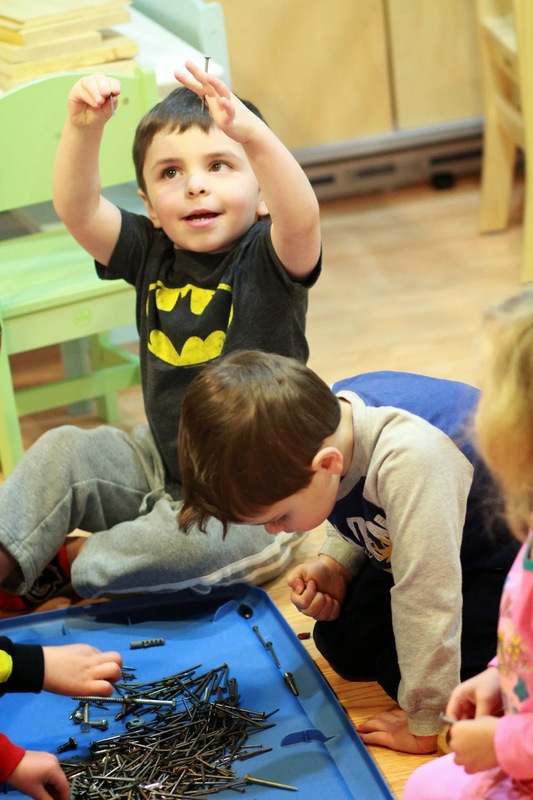 Managed Chaos: The life and times of a Daycare Diva: Hammer Time! Today's project evolved after our morning discussion about all the great Christmas gifts we received over break. Josh mentioned that one of his favorite gifts was this tool kit that Logan and Cooper got for him. He set the package on the table and together the boys huddled around the kit discussing how the tools could be used. Logan told us how his dad built a chicken coop and then Will mentioned that his dad uses hammers in the garage at his house. Josh invited all the kids to take a closer look at the tools; some of the items like the box cutter and screw driver heads were left in the packaging so the kids could safely get a closer look while Josh explained how each one worked. All of the children were pretty excited when Josh offered to share his cool new tools. During our investigation of tools he reminded the children that real tools are to be handled only when an adult is nearby and helping them. Of course the children already knew this and they ran through many imaginary scenarios of what might happen if a child were to handle tools alone - like cutting a finger off or hitting yourself in the eye with a hammer. Our discussion got me to thinking about a bucket of old nails, screws and bolts I’ve been saving for just such an occasion so after breakfast we got to work on our latest piece of art. Once we were very clear on how to handle tools and nails we decided to work creating a project with scrap wood. The next step of our project was sorting, classifying and organizing all the many bits of metal in the bucket o’ nails. I dumped the metal out on a tray and explained again how to handle the items safely. The children were very careful and thoughtful in their work as they collected nails. They payed close attention to the length of each nail and the size of it's head. They compared the width of the shaft on the finishing nails, to that of the regular nails. We talked about lag bolts, S hooks and screws of various sizes, the kids classified them by holding them up next to each other and looking closely to determine which pile they belonged in. As they sorted the nuts, bolts, screws and washers they asked Josh what each items is used for so he demonstrated on pieces of wood.Then he showed them how his tools are specially designed to fit the heads of the screws, bolts or nails and that some tools are used for twisting while others are good for pounding. The children quickly became proficient at noticing the differences between the screws and nails. Soon the entire pile of metal was sorted. Next I set up a space for the children to use hammers, mallets and nails in pairs. I showed them the difference between mallets and hammers then demonstrated how to use one side to pound the nail in and the other to pry it out. They kids were thrilled and ready to get to work! This little one was nervous after our discussion about tool safety so she did lots of observing before she was ready to participate. She also wanted to do her hammering with both her hands on the hammer so she could be sure not to smash her fingers. She directed Josh as he got her nails started then she used both hands to hammer. It was hard work for such a tiny body! Some fingers did get smashed but the kids decided the awesomeness of using hammers outweighed the pain of smashed fingers. After some ice and a hug or a few shakes of their hand they were ready to go at it again. This little guy pounded several nails in the wood only to turn right around and pull them out. He spent most of his time in the hammering station and was most capable of using the tools independently. Again this was all about the process of learning how to use tools - how to pound and pry so it was up to him to decide how many nails should remain in his piece when it was finished. After each nail was carefully removed he pounded one nail in each corner, turned his board upside down and announced that it was a table. Later he changed his mind and said it was a picture of Tuxy his cat, then he drew several circles and triangles to represent her face and ears. Afterward he covered the whole picture up so that most of the wood was covered in sharpie. Allowing children the time and space to experiment in self expression without adult interference is key in their ability to learn to think creatively. It also teaches them to take risks in the process of developing their own ideas so that they feel confident in sharing what they learn through their experiences with their peers. 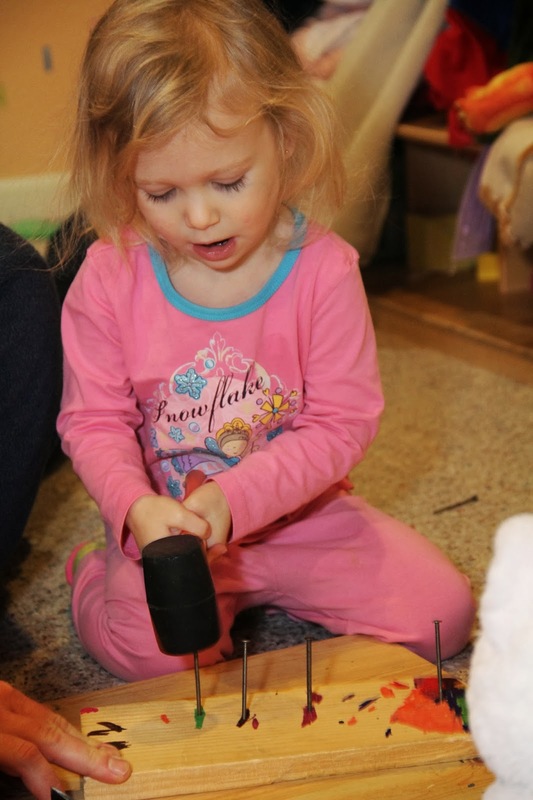 Strengthens muscles from the fingertips to the shoulders in preperation for writing as children swing heavy hammers and manipulate tiny nails. Helps children develop visual perception skills and the ability to focus their attention for long periods of time on an activity they enjoy. 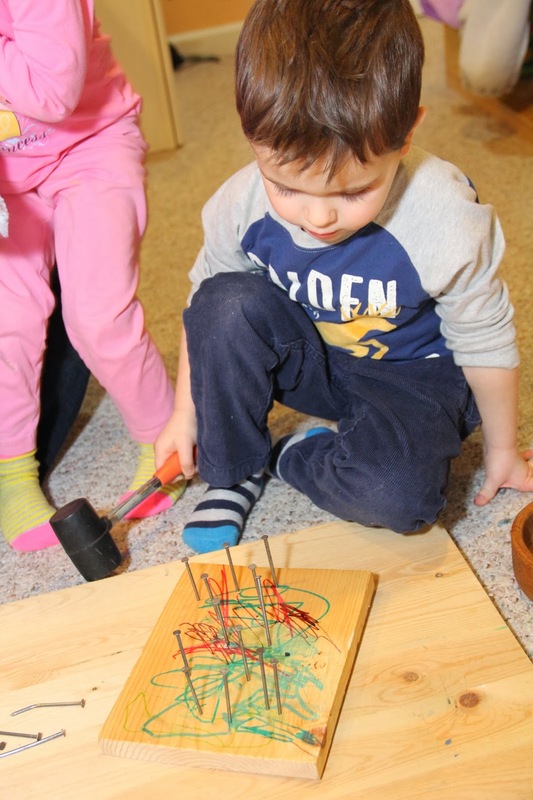 Fosters self confidence, risk taking skills and self regualtion as they take responsibility for their own safety in working with heavy / sharp items. Introduces art appreciation through the use novel media for self expression.